This sturdy shower chair will provide welcome relief if you have trouble standing or worries about falling in the shower. Shower with confidence knowing you have a stable place to sit. This bath chair will make showering easier and safer for people with disabilities, older people or those recovering from surgery or injuries. The chair's frame is made from aluminum which is incredibly strong yet lightweight. The shower chair weighs only 13 pounds yet can support up to 350 pounds. The textured seat has drain holes so water won't build up. And the suction cup rubber tips are slip resistant, giving the chair firm footing on wet surfaces. This durably constructed Metal Folding Chair is a convenient option for everyday use or extra seating in a residential or commercial setting.It features a premium 18 gauge, curved steel frame. 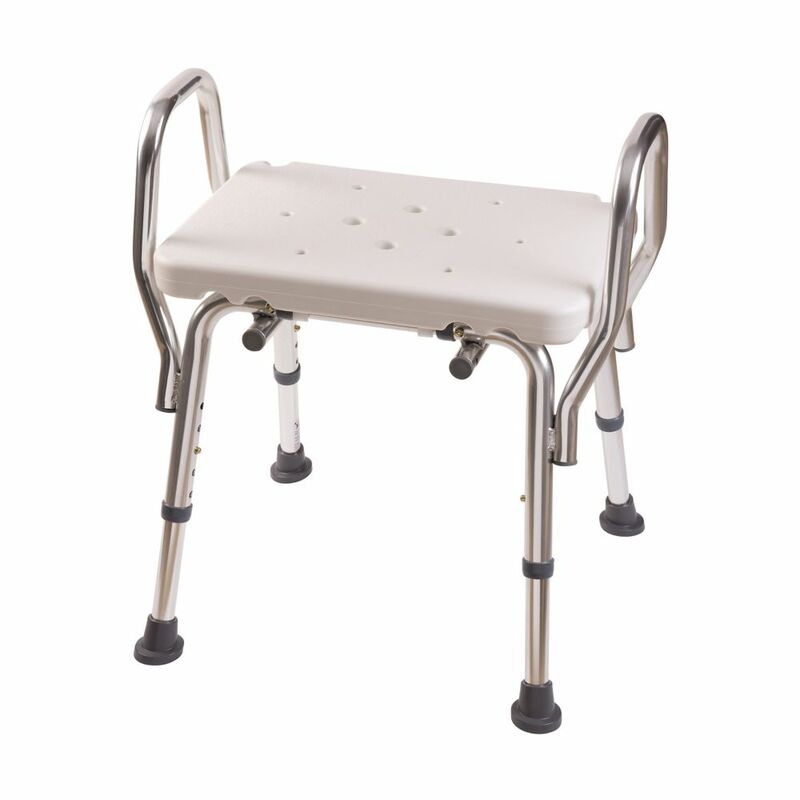 The legs are triple braced, with an integrated footrest, and double-hinged with riveted steel components. Though lightweight and easy to fold, transport and store, it's sturdy enough to hold up to 300 pounds. Non-marring floor glides on the legs protect your floors from scuffs and scrapes by sliding smoothly when you need to move the chair.Designed for indoor and outdoor use, these attractive chairs are a smart seating solution for your next business meeting or special event. Heavy Duty Bath and Shower Chair This sturdy shower chair will provide welcome relief if you have trouble standing or worries about falling in the shower. Shower with confidence knowing you have a stable place to sit. This bath chair will make showering easier and safer for people with disabilities, older people or those recovering from surgery or injuries. The chair's frame is made from aluminum which is incredibly strong yet lightweight. The shower chair weighs only 13 pounds yet can support up to 350 pounds. The textured seat has drain holes so water won't build up. And the suction cup rubber tips are slip resistant, giving the chair firm footing on wet surfaces. Heavy Duty Bath and Shower Chair is rated 3.0 out of 5 by 2. Rated 1 out of 5 by DISAPOINTED from THE PICTURE IS VERY DECIVING. THE TALLEST IT EXTENDS IS REDICULOUSLY LOW . A CHAIR LIKE THAT IS F... THE PICTURE IS VERY DECIVING. THE TALLEST IT EXTENDS IS REDICULOUSLY LOW . A CHAIR LIKE THAT IS FOR THE ELDERLY W/ KNEE ISSUES. IT SHOULD EXTEND TO 20-23 INCHES. NOW I HAVE A WORTHLESS $100 CHAIR. Rated 5 out of 5 by JET10 from Was easy to assemble, and very sturdy!... Was easy to assemble, and very sturdy!